Why does he look so perplexed? He’s seen me do this a hundred times. Why are they cheering? Seriously, guys. Is there something going on in the hallway? You want me to do WHAT in here? I guess I should stop dipping your toothbrushes in it then. "Mama! Look what I made in art class! Guess what it is." These words terrify me. I know this game and I am NOT good at it. It's the "Guess What I Drew" game. I always give it a good 'ole college try despite my fears, but it usually ends badly...for me. Yesterday was no different. It was like the art teacher had cleared out her "Tuck" folder of saved pieces of art. Most were easy to recognize and very creative. He has never been excited about drawing until this year. So, I always make sure I try my hardest to figure out the picture he is asking me to guess. I don't want to squash the little bit of artistic confidence he's gained. Did I mention I am not good at this? Anyways, Tuck walked over and handed me his impressive creation. Let the games begin! Tuck: "Yes, there were sparkles...and you're holding it the wrong way." Tuck: "We read a story about an elephant. See his tusks?" Tuck: "No, he didn't fall. You're still holding it the wrong way." Tuck: "Well, here's the elephant. He is galloping. See his two legs up front stretched out? Then his two legs in the back. There's his head, tusks, ear and his trunk at the very tip top." Tuck: "Exactly, Mama. You got it." Tuck: "He looks great up there!" I think he fits in PERFECTLY, don't you? This post is in response to Trifecta's weekly challenge. It’s Monday again and that means we’re on for another single word prompt, usual rules apply: 33 to 333 words using the THIRD definition of the word. Authors note: We often see hikers this time of year on the Appalachian Trail (AT). Many of these hikers are called 'through hikers'. That means that they hike the complete trail, which is 2,180 miles from Georgia to Maine passing through 14 states. It's an impressive accomplishment. While driving past one of the entrances to the AT yesterday, I saw an older gentlemen with a pack on his back. It got me thinking of his story and why he would take on this journey. So, I made up my own story about him in my head. Enjoy. The fallen branches and twigs snapped under his worn hiking boots. The years glared through his deeply carved wrinkles and thinning, snow white, wisps of hair. A grizzly beard framed his jaw that had not expressed anything in years except regret. His ragged clothes were exhausted and thread-bare. Each night they became less of a support and sense of warmth, threatening to let go of their hold on him. The pack, worn high and tight on his back, held shadows of his past. This was his way of “working through it”. The only company he kept was the trail. It kept all his deepest, darkest secrets in the strictest confidence. He could always count on the birds to chirp a cover for him as he murmured his confessions to the earth below his feet. Every curve revealed a new discovery. He acquired glimpses of upcoming challenges in his guide book. He had learned that sometimes the book did not always fit him. Some of the more difficult areas of the trail were no match for his years of experience, whereas, what would seem more simple stretches, became an arduous task. He had been walking from dawn to dusk for months now, determined to repair all that was damaged. He ended his day of hiking the same as always. He sat, released the confines of the pack from his back, and unzipped it. The fragrance from her silk scarf that was folded neatly at the bottom, though scarce, was still apparent. It always intoxicated his being. Forty-five years of her by his side was not long enough. He’d reach her on this trail. He’d connect with her tenderness. This was his pilgrimage. He knew, however, the trail held the biggest lesson yet to come. He had to learn to go on without her. MORE MAC AND CHEESE, PLEASE! "Mama, this plain elbow shaped Mac and Cheese tastes different than the Cars shaped Mac and Cheese." This was my dinner conversation last night with the kids. As we sat there eating our delicacy of Kraft Mac and Cheese with a side of carrots, they argued this point back and forth with me. Tuck was getting serious. "Mama! Listen! The Cars don't taste as good." I told him maybe it was because of all the exhaust fumes. He appeased me with a half-hearted chuckle. Mags jumped in to support her brother. OK, little Miss Mighty. Got it. No need to get all worked up. So, I went over the list of smile-inducing shapes they've eaten. "What about the Halloween shapes? Christmas shapes? Phineas and Ferb shapes? Princess shapes? What you're saying is elbow Mac and Cheese is the best. Right?" "Yes, Mama. They are the best. Oh, and the ones that look like a swirly slide (spiral shapes) are pretty good too." "The kids insist that Kraft Mac & Cheese plain macaroni shape tastes different than Cars shaped Mac & Cheese. Ummm.... #sillykids"
Thanks to my friends Michele and Becky, along with a few other followers, who were quick to straighten me out. So feel free to join in on the fun in the comments below! I'd love to hear your opinion on this thought-provoking topic. "See, I told you so, Mama!" "Hey, Honey, that movie 'Chimpanzee' just came out in the theaters. You could take the kids to see that today if you wanted." What a great thought, my darling husband. Stellar idea. Let's just review how this went, shall we? 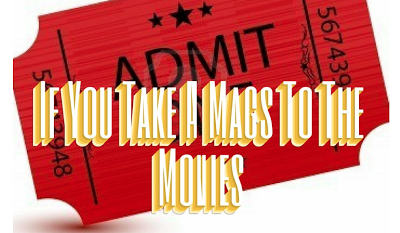 (I borrowed this 'form' of writing from 'If You Take a Mouse to the Movies'. Thanks to Laura Numeroff for her clever writing.) Also, thanks to my encouraging friend, Michele at ODNT, for giving me the idea and confidence to post this. FLIP BOOK VERSION OF THIS POST. "Now for the weekend challenge: we want you to give us a re-telling of the classic Goldilocks and the Three Bears story. You can change the setting, the characters, and whatever details you wish, but the story should still be recognizable to us. Keep the spirit of the original work, but make it your own. And for once? You have no word limit." The defendant was noticeably twitchy. She watched intently as the judge sat himself in the chair, looked the papers handed to him by the clerk, and spun to face the courtroom. He looked back and forth between the words on the white, flimsy paper and her. As he read, low growls of disgust were emitted from his mouth. He sighed, put the paper down, and stared down the young girl. Uncontrollable sobs overtook her. She had been locked in a holding cell with a grumpy, old troll who insisted he was innocent and had every right to defend his bridge for a few days now. “Is your mother here in this courtroom with us today?” The judge asked a bit more tenderly. The girl shivered and cried. The judge caught himself as he began to yawn, shook his head, and sat up straight. “As it seems, you did not have malicious intent. I have two curious children of my own who have got themselves into some hot water from time to time. I am assigning you 50 hours of community service in the park across from the courthouse. Some billy goats have eaten all the grass on the other side of the bridge, so it could use some replanting." The judge continued on as he pointed down at the young girl. "Well said. Now go on, get out of here, and live happily ever after." Mags: "Tuck, what if there's a real troll under this bridge?" Tuck: "There isn't! It's just Daddy, see? You better go first though, just in case." This is the fourteenth installment of "Picture This". Mags: "Mama, you make the best dinners ever. This is so delicious, except for the potatoes. They are gross." I can heat up chicken nuggets and fry a grilled cheese like nobody's business. I can make sides of fruit and raw vegetables in two seconds flat. Every night is the same battle in my head, though. What to make for dinner? I am not a 'cook' that thinks out of the box. Heck, I'm not a cook at all. I don't try to get creative with spices and exotic ingredients. Mostly because I end up wandering up and down aisles in the grocery store looking for them and then end up completely frustrated. Let's take this recipe for example: Ginger Pot Roast with Quinoa Salad and Ginger Pineapple Compote. I immediately see this and get out my iPhone to ask Siri what 'Quinoa' is. She sends me a link. Thanks, Siri, you are so helpful. The website tells me this particular food came from the ancient Incas and how it's shaped like small, oval, white beads that cook like rice. However, these suckers plump up to four times their original size. Awesome. The kids will love it if it looks like some sort of pasta. Never mind this website calls it the "super grain of the future". SCORE! Oh, and it has a similar taste to couscous. Even better. From this description, I know exactly where to find it. I strut down the rice aisle, being all sophisticated-like, looking for Quinoa. I pass by the Minute Rice and Uncle Ben's. Nothing. I must have missed it. I go back to the middle of the aisle and start down again. I scan the bottom shelves, top shelves, and all the shelves in between. Nope. Still nothing. I walk back out of the aisle and see a smiling lady stocking shelves full of Lucky Charms. "Can I help you find something, Honey?" I explain I am looking for Quinoa. What is this helpful lady's response? Great. The lady who WORKS at the grocery store doesn't even know. She tells me since it is such a fancy name (I kid you not), I should look in the "exotic food" aisle. This is what this lady called it. In reality it just one aisle of sticky rice and taco making kits. However, on the bottom shelf, there it was! Quinoa. Woohoo! I got so excited. Pathetic, I know. I grabbed a bag and checked out with the rest of my weekly groceries. By the time I got home, I was full of myself because I was being so adventurous (for me). I pulled out my ingredients and started to get them in order. That's when I realized that I forgot something. The Ginger Root. AAAAH! Since it's in the name of the recipe...TWICE...I guess it is a necessity for success. My new found cooking ego deflated like a balloon. Sigh. Then I looked closer at the recipe and saw the cooking time was almost three hours. Oh, heck no! I'll save this one for some Sunday when I'm 65, have time on my hands, and my grandchildren are coming over to visit. After all, they did say that Quinoa is the super grain of the future! So, who wants some chicken nuggets? 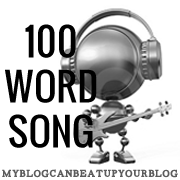 This post is in response to Lance's 100 Word Song on My Blog Can Beat Up Your Blog. I've been intrigued by this writing community for weeks. I took the plunge this week to one of the weirdest songs I've ever heard. The rules are you listen to the song give and then write in EXACTLY 100 words that were inspired by the tune. This was a challenge for me and it pulled me out of my comfort zone. It's good to stretch every once in a while, though. Thanks, Lance! This is what flowed from my brain after hearing 'Lillies & Remains' by Bauhaus. The process is daunting. The task at hand is unnerving. Facing what you have turned from. What has made you. The choices that brought you here, to this valley of silence, is what you were longing for. Why question it? Just let it be. Life had become too loud and the blocks you were building with were swaying, threatening to topple at any moment. There was no other way than to let them collapse around you. Do take care in your selection of the placement of the pieces this time. To regain and rebuild is your goal. It’s your savior. Meg snapped out of her trance and looked into the stern eyes of Sr. Henrietta. The seventh grader instinctively smoothed out her tartan plaid, pleated, uniform skirt and gave one quick tug to each of her green, wool knee socks. Her back straightened stiff like a flag pole as she took a deep breath in. Insulted, the nun slammed the blue book marked “Religious Studies” down on her desk . It startled the class and all the students jumped in unison as if rehearsed. Meg looked down at her desk shamefully. Her words were cut short by the whir of pages inches away from her ear. It was the thump that made her realize the blue book lay on the floor behind her. Sr. Henrietta’s arm was still outstretched. Stunned, Meg quietly collected her backpack and made her way to the office. Sitting across from the principal they smiled at one another. Meg broke the silence. "Mama, It feels like I swallowed a bunch of gnomes and they are all poking me with their pointy hats." After that I couldn't stop imagining little yard gnomes grinning as they jabbed my son's insides. I did some breathing exercises with him to help with the cramps and explained how gulping the bottle of water before class probably was not the best idea. Once we got home, the pain had alleviated a bit. However, as soon as we walked up the stairs and he had a brand new audience (our four-year-old), those gnomes started poking full force. Tuck: "Mags, don't hug me too hard, I feel like I ate a bunch of gnomes and their hats are poking my belly. "Mags: "YOU ATE GNOMES?" Tuck: "NO! I just FELT like I did. My belly hurts." Mags: "Well, you shouldn't eat gnomes. Then your belly would feel better. I'm telling Mama you ate them." Tuck: "Mama knows. I already told her." Mags: "Mama knows you ate gnomes?" Tuck: "Mags, LISTEN! I told Mama my BELLY hurt." Mags: "Did you tell her you ate gnomes?" Tuck: " I didn't really eat them, Mags. I was just saying I FELT like I ate gnomes with pointy hats. That's how my belly feels. Like someone is poking me." Tuck: "Ouch! Why did you poke me? You know my belly hurts!" Mags: "Because you shouldn't eat gnomes. That's rude." The moral of this story is you should listen to your mother and not gulp a bottle of water before gymnastics class. You should also not begin a story by telling your four-year-old sister that you feel like you ate gnomes. She will only hear the words "you ate gnomes". Lessons learned. POKE! Tuck: "Can you believe I just did that all by myself? That was awesome!" Our six-year-old learned to ride his two wheeler this weekend...again. We started working it at the end of last summer when he asked to take his training wheels off. He was able to do it. We practiced and practiced on his bike. Then fall and winter came and now here we are. Warmer weather and two inches taller. Here's the thing, Tuck outgrew the bike he was riding. His first bike was lower to the ground and less intimidating when he fell off. His new bike is bigger, obviously, and offers more height. The saying 'it's just like riding a bike, you never forget' didn't apply here. He forgot. If you think about it, there are lots of things you have to do simultaneously when riding a bike for it to work. You have to pedal to keep up speed, steer the handle bars to stay on course, and know how to properly use your brakes without flipping over the handle bars. 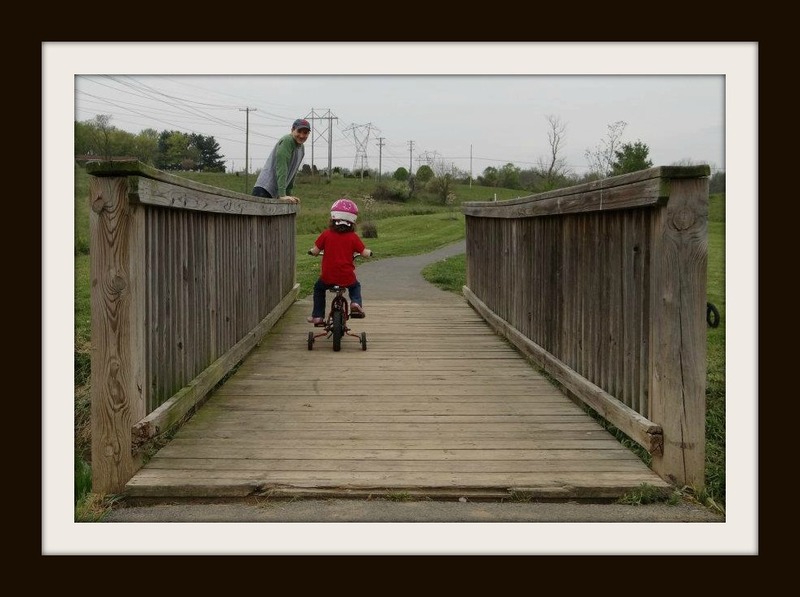 When we got to the trail, I took Mags on her tricycle to get reacquainted with pedaling. I noticed that Tuck was not the only one who had grown out of his bike over the winter. She was content though, pedaling, steering, and watching the boys. Tuck and Chris headed down the path with his new, bigger bike. They started with the basics. Tuck's cautionary personality set in pretty quick. "What if I fall, Daddy?" Chris explained that he could just ride into the grass on either side of the paved trail. That way he wouldn't hurt himself. Then off they went. Chris held the back of the seat for a big, then let go. Tuck would remember to pedal, but forget to steer. KABOOM! Chris would run over and give him some instruction and a reminder about steering. Tuck would nod, agree, pull his bike up, and they would start again. The next time, Tuck would steer really well, but forget to pedal, lose momentum, and tip over. Chris would swoop in, help him pick up his bike, and offer more suggestions and instruction. This went on for an hour. Tuck was exhausted by the end, but he had made significant progress. He had ridden by himself for lengths of the trail. He was really getting the hang of it. "No, Mama. I can do this. Let me try." I took my cue to back off and told him I was going to run ahead so I could snap some pictures of him. He waited until I was positioned and watching him. Then, you know what? HE DID IT! ALL BY HIMSELF! He got on, pushed the pedals, steered...a little shaky at first...but then he was off like a shot! We watched him go back and forth on the trail. He had a few falls here and there, but overall rode around like he'd been doing it his whole life. What Chris and I realized was that backing off gave him room to breathe and figure it out himself. Chris' instinct was to run over and talk his ear off about what he did right, what he forgot to do, and how to correct it for next time. In the end, Tuck knew what he needed. He needed us to SHUT UP! He needed to process all the steps on his own and figure it out. Sure enough, he did. The smile on his face and the pride that was beaming from his whole body was a moment I'll remember as a parent and will be a story I can tell all his future girlfriends. He wasn't the only one who had a big day with bikes, though. Mags, who was riding her tricycle, decided she was ready to move up to Tuck's old bike. Same process, different kid, different needs. remind us when it's time to let her go. For this week's challenge, you have to write a letter of apology in exactly 33 words. Addresses, salutations, closings, etc. (should you wish to include them) do not count in the 33 words. I’m sorry I didn’t shine through brighter. My lack of being there was devastating. I didn’t see how desperately you needed me. I won’t make that mistake again. Forever onward, I’m with you. Mags: "Poor Papa has a crack in his leg. Don't touch his leg. The crack will get bigger if you do. That will make a big mess." The playground is such a fun place with swings, slides, and monkey bars. My kids start to beg to walk down to the park with Papa (my dad) the second they get to my parents' house. They always come back exhausted and out of breath...all three of them. "Get dressed, let's go to the park. ", it was completely normal. I didn't get it at first. I knew he was trying to be discreet. I knew he was hurt. My dad has a crazy pain tolerance. He always just shakes injuries off. He wasn't shaking this one off. I ran upstairs and got my mom. I gave her the lowdown and then headed back to check on him. When I got to the bottom of the stairs, he was emerging from his bathroom with gauze and Band Aids in hand. "Oh, yeah, that's a doozie." From afar I asked him how he did it. He explained that he was chasing the kids around. Mags was at the top of the slide taunting him with a "neener, neener". He went to climb up the METAL slide to chase her, but his shoes had sand on the bottom of them and they slipped. His shin caught the corner edge of the slide. It was painful to imagine. After my parents left to go to the hospital and the kids came out of their trance from the show, they asked where Papa was. I told them that he had hurt himself at the park and got a big cut. Both of them sat there and argued with me. "No he didn't. He would have told us." "It's not safe to run up slides!" She's so helpful after the fact. Ten stitches later, my dad is on the mend. Today is our last day before we leave to go back home. We decided we are going to grab some lobstahs and steamahs and take a walk along the beach. It's a nice, relaxed way to end the trip. Plus, there are no slides on the beach. Mags: "You know what Mama? I'm gonna hug and kiss my new fish every single day. Yep. I sure am. And I'm gonna bring him for walks in my baby carriage." Oh goodness. That poor fish. Tuck quickly straightened Mags out with his detailed explanation of how fish have gills, need water, will die if they are in a baby carriage, no hugging, no kissing, that's gross, and so on. We bought new fish over the weekend. Usually our fish have a tank life of four to six months. The kids were so excited. Chris promised them he would set up the tanks when he got home from work. Since we are in Boston visiting family right now, he sent us some pictures of the set up. Great job, Chris! Of course, you can't really see the fish in the picture. Tuck noticed that right away and told me to text Daddy to ask him to send a picture of his fish, Tractor Beam III. I did, but never got a picture back. I chalked it up to him being busy at work and forgetting when he got home. To be fair, I had forgot all about it, too. That is until last night, while we were doing FaceTime on the iPhone. Tuck remembered right away and asked Chris to show him his fish tank. We looked at it and our boy commented again how he couldn't see his fish. Chris started moving the camera on the phone around the tank so we could find the fish. Nope, that little bugger must have been hiding. Mags' old fish did that. They are really good at 'hide and seek', unlike someone else we know. CoughReadThisPostCough. We told Tuck the fish was probably just behind the big Nemo and reminded him how they like to squeeze into small spaces. We said good night and the kids bounded down the stairs to go watch a movie with my mom and dad. I lingered upstairs and tidied up a bit. The phone rang again. I looked at it and noticed it was Chris. He must have forgotten to tell me something. I picked it up and he asked if the kids were around because he had to talk to me privately. My heart sank. "Who died?" was the first thing out of my mouth. Since we were on FaceTime, he pointed the camera on the phone down and revealed the fish in one of Tuck's socks. The darn thing had jumped through a small hole in the top of the lid on the tank. He landed on a sock that was on Tuck's floor. Good thing for those seven day dead fish guarantees at the pet store. RIP Tractor Beam III, hello Tractor Beam IV. Shhhh, don't tell Tuck we are doing the buy a new fish trick while he's gone. Shhhh, don't tell the new fish what Mags said about hugging, kissing and taking them for walks. Maybe the fish heard her and couldn't handle the pressure. Today was an adventure in a great way. My wake-up call was 3:30AM and I've accomplished a lot since then. Let's see. I've flown with two small kids, went to breakfast with my parents, played with trucks and Legos, drank coffee with my mom, hugged my mom a hundred times, drove to the beach with my dad and the kids, got blown away by the wind there, drove to the less windy park, chased Tuck around while Mags screamed on the swings, "HIGHER, PAPA!" to my dad, watched my dad whip up a delicious meal, ate the meal, visited with my niece, watched a movie with the kids and my parents, called Chris to say good night, and then attempted to get the munchkins to settle down to go to sleep at 8:45PM . Like I said, today was sweet. There was a lot of laughter and excitement. Mags was listening to my old iPod that we loaded up with her favorite music. She pulled it out of her princess suitcase, plugged in her headphones, navigated that little device like a pro, and began dancing. She danced her heart out. She wiggled, jumped, shook her head, and threw in a little air guitar for good measure. There were a few business men around me and one business woman. All of them were dressed in suits. All of them had huge smiles on their faces watching my four-year-old dance like no one was watching. I caught the tail end of her spontaneous performance on my iPhone. Everyone has a "bribe" file for their kids, right? Well, this one is going in mine. As well as in my "I really need something to make me smile today" file. "MAMA! I got the window seat. This is the BEST day of my life"
Guess what? I did it again last summer. It was a ton better. Both kids were exceptional. 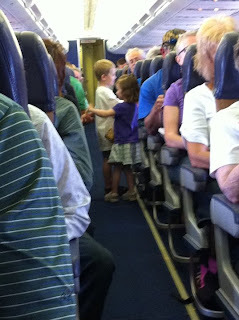 They were so excited to get on a plane and chose the very first row of seats. There were three across, so it was perfect. The cockpit was open at the time. The pilot noticed my munchkins gawking at him, so he got up and invited them in. I was sure Tuck was going to pee his pants when the pilot strapped him into his official seat. So many buttons, so little time! It was awesome. The kids were in awe. As if that wasn't cool enough, the steward thought my kids were the cat's meow (smart guy). He let them pass out the snacks at 30,000 feet up and down the aisle of the plane. OK. So, he was probably a bit lazy and just didn't feel like passing the snacks out, but still, it was a memory my kids will never forget. When Tuck and Mags sat back down and buckled in, the steward handed them each a large, plastic bag containing about 25 small bags of pretzels as a reward for a job well done. CHA-CHING! What did I get as a reward? The flight attendant dude saying to me, "Those are the most polite kids I've ever had on a flight in my eight years of doing this job." Double CHA-CHING! the enormous bags of pretzels. "So, the Easter Bunny doesn't come in my room to leave eggs, right? He's like Santa and the Leprechauns? He just stays out in the living room, right?" As much as my kids still believe in the magic of whichever season we are in, they are comforted in the fact that it is just that. They really like the idea of the Easter Bunny coming to hide eggs around the house and candy for them to eat, but they don't want him in their rooms, well, at least Tuck doesn't. Every year he has us reassure him over and over again that Santa, the leprechauns, and the Easter Bunny all stay out in the living room to do their thing. The thought of a six foot bunny or a man in a red suit in his room is overwhelming. I can see that. I wouldn't want a rather plump, old man rustling around my room in the middle of the night either. Since Mags has heard our song and dance about this subject since she was born, she doesn't question it as much. To be honest, I'm not sure she would really mind if they came into her room. She has a few stories she'd like to tell them. They could sit right down, she'd whip up a quick tea party, and they could stay up all night together chatting. However, I am pleased to report that after six years of explaining how these magical people and creatures come in really quick, drop their loot, and then move onto the next house, he believes us. Isn't that awesome? He has been so relaxed about it this Easter season. He hasn't stressed about it once. You know why? Because he has been so busy wiggling his loose tooth. That sucker is going to fall out in a few weeks for sure. Then we will leave the tooth under his pillow and at night the Tooth Fairy will fly into his....ruh-roh, Raggy! Houston, we might have a problem. Or...maybe we won't. I'm pretty sure Tuck might be a little bit more laid back about a sweet, little fairy fluttering in his room to trade his tooth for some money. If not, that's cool. We'll just leave it out in the living room like we do with the milk, cookies, and Easter baskets. Problem solved. The real question is....what is the going rate for a tooth these days? If you could help Chris and I out with this, we would be so grateful. your kid's pillow in the comments. This post is in response to Trifecta's Trifextra weekend writing challenge. For this week's Trifextra, they switched it up a little bit. The challenge is to write a response that is between 33 and 333 words long and uses the words 'cacophony', 'soap', and 'insects'. We can use the words however we want, but they must all appear in the writing piece. Oh, and they must appear in order. So, without further ado, I present my story. The sun was was sparkling through the leaves. I stared at it, feeling the wind tickle the back of my hair and then, reversing direction, caressing my entire face. It was a nightly ritual, swinging from the swing that Daddy had hung in our tree. He was usually home by now in time to push me, but today he was late. “Maybe an unexpected call?” I whispered, thinking out loud. That sometimes happened and it drove Mama crazy. Tonight we ate dinner without him. I could tell she didn't enjoy a morsel. Mama thought the food never tasted as good when he wasn’t there. “Dinner is a time to come together after a long day and get reacquainted.” She’d remind me. The police car slowly pulled into the driveway. The officer laboriously stepped out, carefully positioned his hat, and pulled his uniform coat down in one, hard tug. He looked up and caught my eye as I swung. He forced a half smile at me and then moved slowly toward the front door. The wind was at my back, then at my face. A gentle knock. An introduction. The wind was at my back, then at my face. A shrill, unmistakable scream. I instinctively jumped and felt the earth beneath my feet. I ran to her. Ran to my mother whose cacophony of wails was loud, high pitched, and unrelenting. I fell to my knees and squeezed her hands that were still covered in soap from washing the dinner dishes. Mama's words buzzed in my ears like insects.